Or do I want the dramatic deep banded vee of this one? It is, alas, purely an academic question, as they are both B30, and despite having saved links to every.single.page online that explains how to grade patterns, I don't actually do so. So I've just put out some feelers … these have to have been made in other sizes, at some point, right? Thanks to Rachel for the link — click on the images to go to the Etsy site for fourlittlesparrows. She's got some other nice patterns listed, too … and they're VERY reasonable. I think these are eight bucks. Also, a couple people asked me about the fabric for the dress I wore yesterday at Tools of Change. It's this, which I thought I had posted about before, but sadly can't find the entry for now. Wow, wow! I am in love with the first one! Erin, Erin, Erin . . .Why CHOOSE!You can have both! You need them both. I need them both. I can’t even remember a time when I was B30, except pre-puberty, and I know these dresses would look good on a nice (adult) curvy figure. When you get them, and make the dresses, please post photos. That second one is worth getting and at least ATTEMPTING a size-grade. Holy cow. Heck, I’d get it just to admire it. Good grief–I don’t think I’ve been B30 since I was about ten. There must have been some scrawny women running around in the 1950’s. Are they not the best?!?! Most are uncut patterns too….mmmmm. I love the second dress, I can see the three quarter sleeve style in a textured fabric, something with a bit of body, so the shaping and the sillohette doesn’t vanish in the fabric. A wool twill weave, perhaps a wool gabardine. The short sleeve must be made in a light rayon challis print for summer days like today. Or a printed vintage linen, and keep an iron handy for all the wrinkles. Oh my, that first one looks like a young Barbara Stanwyck at first glance. Can you imagine the joy of sashaying around as Barbara Stanwyck? The 1st dress is pretty, the 2nd is elegant. Before I scrolled down to see the second one I was sure no dress could possibly be better than it. After the scrolldown I am thrown into confusion and doubt. They are both gorgeous. And geez, I am *super* flat chested and still a B31 (don’t have the W22 and H32 to go with, though, that’s for sure). I was looking at both of those patterns yesterday on etsy, hehe. I ended up getting this one instead http://www.etsy.com/view_transaction.php?transaction_id=5623448Which is in a much more reasonable size. Who has a 30″ bust anyways? I love the first so much. But I can’t invisage a 30″ bust woman with such a large cup size as depicted! My vote is the first one. Maybe I just have a thing for wingd sleeves. The first one has stolen my heart. The sleeves are just delightful. And I don’t use that word lightly. Wow – I gasped when I saw the first one, and sighed with pleasure when I scrolled down and saw the second one. I’m with knitgirl: pretty, and elegant, in that order; but both of them stunning. Thanks for the eye candy! And I love love love that alphabet fabric. Thanks so much for featuring my patterns!! Both of these patterns were sold this morning. They are so nice to look at. . aahh. I vote #2, and only #2. The first one is just a bit too much, my eyes keep darting between the wings and the bodice and the belt, and never to the face. The second could be worn by anyone at anytime to be NOTICED. That dress has attitude and elegance and grace. I just love it. The deep V for sure–I love standing collars. I really like the second dress. It is so elegant with the pearls and little gloves. Oh, you definitely want the first one. Well, I do anyways, but I’m not very good at pattern drafting yet. Wait! I’ve just realized you said it is a B30! So I might not need to draft it at all because I have a ten year old boy body! Huzzah! the second one looks a litle too space age for my tastes. the first one is the epitome of perfection!!! Oh, the first! I’ve never seen anything quite like it. I’ve seen things in the neighborhood of the second before. But they are both really pretty. Yet another vote for dress 2! The first is a little busy and young for me. But again B30, oh so long ago, maybe when I was 15? I love how the skirt is gored a slightly flared.But oh so beautiful! Both are too wonderful for words…sigh. I have heard of places that will grade patterns for you: they charge by the pattern piece plus each size up for each piece, so it can add up. When I see some of these patterns, I begin to think it might be worth it.I sent a pattern picture to you, Erin, but it really pales next to these! 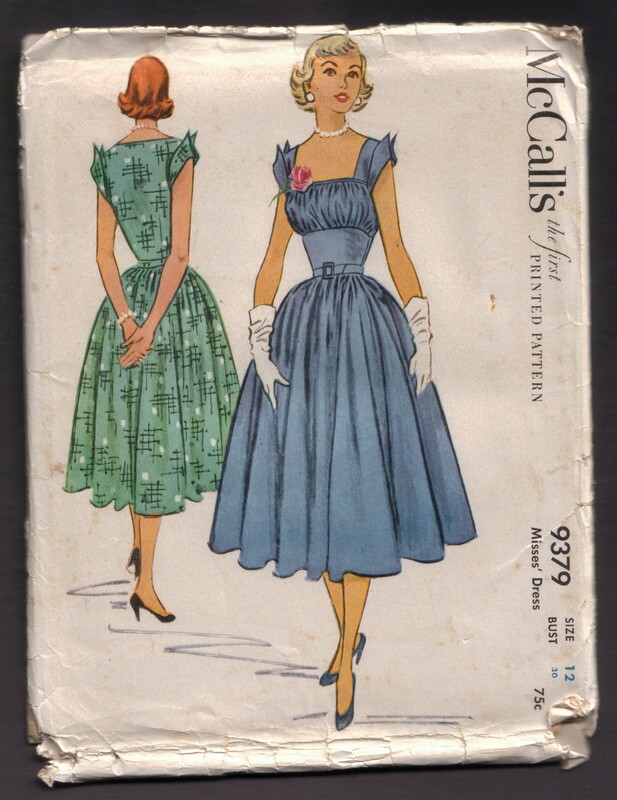 I saw a dress similar to #1 on the VCA board recently (wish I could remember which seller…my bad.) The gathered bust was made up in a sheer black fabric over a pale (almost flesh tone) pink. The rest of the dress was black. Very stunning, classy and yet slightly naughty…like it said look at my pillows, but don’t even think of touchy.I couldn’t really make my mind up between the two. #2 with short sleeves would be awesome. So flattering and ladylike! 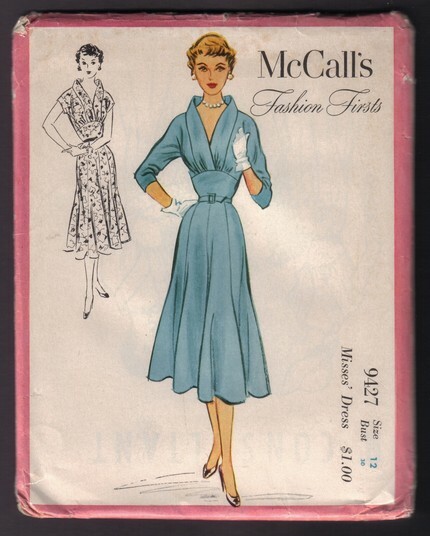 In a drapey vintage rayon it would have a very modern, soft feel.Sorry, but I’ll pass on #1. Shirred busts like that make my 38C tatas look like a big blob. My tiny tittied friends have problems filling out similar necklines, so I’m not sure who looks good in these. The sleeve points make me think of star trek. I am literally so jealous of whomever bought the second pattern, even if I can’t sew, and have no sewing machine… Beautiful & thanks for sharing! with every post you make, I am reminded that I live in the wrong decades and most certainly should have had my figure in the 50’s and 60’s. Oh the dresses. If I HAD to choose, I guess I’d take the second one. But I’d take both and do away with the little wings on the first one. Saw your picture via the link to conference… #2 is your style, hugs the hips slightly with fullness at sweep (#1 would add too much fullness at hip area) #2 bodice lines are more vertical, better for you (#1 is very horizontal in feel in the bodice and I don’t think would look good on you.) Print of fabric in your conference picture I’m sure is cute, and style of dress is nice, but from a distance all you see is color, and sadly the picture looks like someone’s hospital uniform. Again, up close I’m sure it probably works, but not if you’re a speaker and people are looking at you from a distance.